Even though Jedd and I are not planning to return to the typical world of work until 2015 (and even then, we hope to be doing something more adventurous like teaching English in Japan, staffing the Semester At Sea ship, or starting our own online company), I’ve collected a valuable set of resources for job seekers nonetheless. I know many current Volunteers as well as RPCVs (Returned Volunteers) are anxious about finding a job. Even more so, Peace Corps Volunteers tend to want work that is meaningful and a good use of their skills. Whether it’s in government, a non-profit, or a random gig on the other side of the world, these are the best sites I know of to get your job search started. Have you found other helpful resources for your job search? Please share your recommendations in the comments section below. Many Peace Corps Volunteers are on track to either work for the government or pursue international development in some way. Two years of service abroad as a PCV- and all the experiences that come with it- can be a great pathway into this highly competitive career field. If you want to work for the federal government, including Peace Corps headquarters, this is the place to start. Or go here for vacancies specifically at USAID. 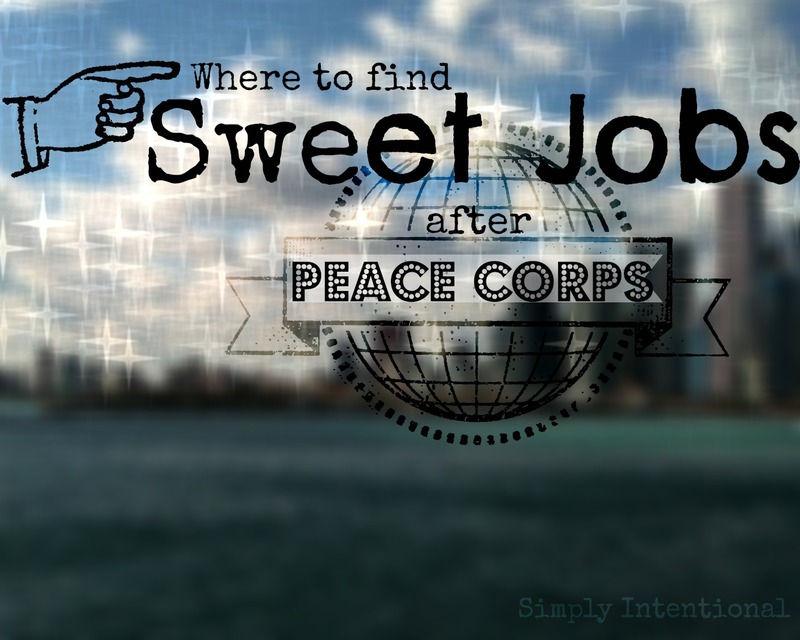 Remember you can use Peace Corps non-competitive eligibility for government jobs! This site is an industry leader for non-profit work, education, community development, and more. You’ll find everything from full-time jobs to part-time entry level to internships and volunteer opportunities. Not all RPCVs have their sights on development work but many share a love of adventure and a desire to see the world. For those who, like us, aren’t ready to work in a cubicle, there are some great options for you, too. For those with a little more job experience, this site is dedicated to finding exciting, meaningful, non-corporate jobs all over the world. It’s free to join and get weekly updates about really cool job openings. These listings are primarily seasonal but all the jobs are in adventurous locales. You can search by category, location (like National Parks), or season. A great short-term strategy for those who just need something to keep them busy after re-entry. Use your freshly developed agriculture skills- or gain some with these new experiences- in one of these international networks of hosts giving room and board in exchange for a few hours of work. Find gigs just about anywhere in the world, from organic gardening to assisting guests at a country B&B. Stay for a few days or a few months, depending on the host. Note that you will need to pay your transportation to the worksite and most do not pay any hourly wages, but if you’ve got the means, it’s a fantastic way to continue meeting people and seeing the world cheaply. Unlike the above links, the Peace Corps Office for Returned Volunteers is the only one set up exclusively for RPCVs. Their Career Links page lists openings for companies that are specifically looking for a Returned Volunteer. Also, if there is any way you can make it to PC’s National Career Conference (in D.C., annually) or their Regional Career Events (this year in Chicago and Nashville), it is well worth it! We happened to see part of the conference while we were in DC for the Third Goal Summit, and I was really impressed how they packed in such a wealth of information, experience, and ideas by drawing on Peace Corps’ deep network of RPCVs from a range of career fields. Check out upcoming event dates here. Are you looking for a job? Have you found any resources worth sharing with the RPCV community? Please share in the comments below. Another excellent blog post, folks! A good site for temporary positions (this would fall under the “Outside the Box” heading) is workaway.info. It lists hundreds of short-term, part-time positions around the world. Typically, hosts offer food and lodging in exchange for about 5 hours of work per day, 5 days per week. Jobs last from a week to a year. We’ve done three so far and all were enjoyable. Workaway is a great way to experience another country and culture in ways that tourists rarely do. Bob, thanks for the tip! Sounds a lot like HelpX, which we are planning to do on our trip to France! Where did you “work away?” I’m hoping to get a few more links from people and then I’ll add them to an update of this post, so I”ll be sure to include Workaway.info. We did 2 in Australia (a week at a guest house in Queensland, and 2 weeks at a caravan park in Victoria), one in Ecuador (3 weeks at a birding lodge), and just returned from 4 weeks on a sheep farm in the Falkland Islands [so that’s 4, not the 3 I told you! ].